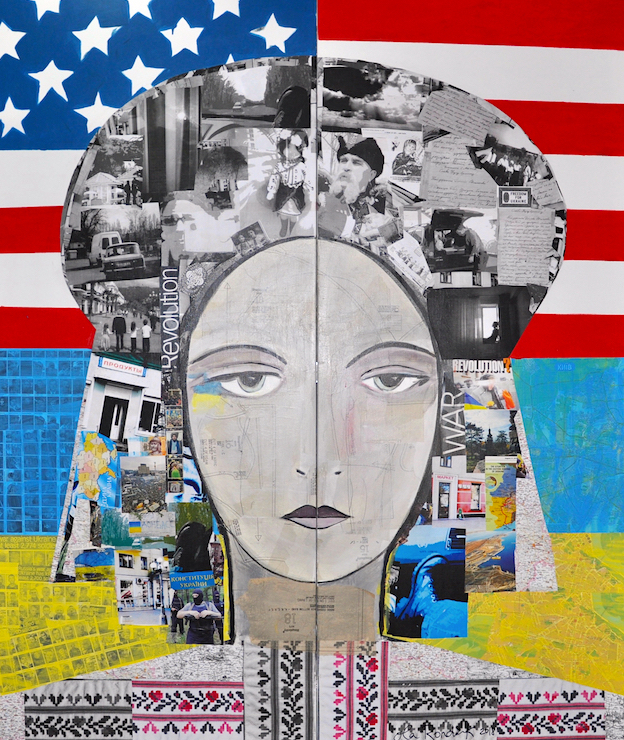 Art at the Institute concludes its 2017–18 season with an exhibition of mixed media works by American-born Ola Rondiak, titled Identity, Interrupted, in which the artist uses traditional cut-and-paste collage and painting techniques to touch on influences ranging from personal history, womanhood, ethnic and national identity, politics, to street art. Curated by Walter Hoydysh, PhD, director of Art at the Institute, this marks Ms. Rondiak’s first showing with The Ukrainian Institute of America. A fully-illustrated catalogue will accompany this exhibition with texts by Marta Kolomayets, director of the Institute of International Education in Ukraine, and Kathrine Page, Gretchen Hupfel Curator of Contemporary Art at The Delaware Contemporary. Ms. Rondiak’s work is situated between collage, painting and assemblage. She reinterprets the relationship between image and text combining printed newspaper fragments and fabric patterns with painted representations; scrutinizing social norms and roles, questioning models of representation and perception. It is a ritualistic way of absorbing and processing the rendering of an inner reality, where her tribal senses come out in images instead of written words or vocal sounds. With these works, her actual creative process varies considerably, sometimes producing several works simultaneously. Two central and repetitive motifs bear witness to Ms. Rondiak’s narratives: the “motanka,” the faceless handmade rag doll/talisman signifying the woman-goddess, and the “vinok,” the traditional Ukrainian flower crown representing the purity of womanhood. Combined with the iconographic depictions of her anonymous female protagonist against backdrops of disturbance, the emerging outcomes metamorphose into a metaphor for Ukraine herself, and an ever optimistic attitude toward the singular dignity of not only of the Ukrainian woman, but of women everywhere. Selected past solo exhibitions of Ola Rondiak’s works include installations at RA Gallery (Kyiv, Ukraine), America House (Kyiv), Mystetskyi Arsenal (Kyiv), The Delaware Contemporary (Wilmington, DE), and Zorya Fine Arts (Greenwich, CT), among others. Raised within the Ukrainian-American community in northeast Ohio, Ms. Rondiak moved to Kyiv, Ukraine in 1995, where she currently lives and works. Exhibition hours: Tuesday through Sunday, 12:00 to 6:00 PM, or by appointment.